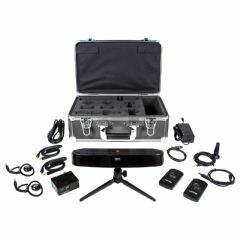 This portable IR system is perfect for venues looking to offer hard of hearing visitors or employees a secure and enhanced listening experience. The iDSP is pre-configured easy to set-up and includes everything needed for assistive listening compliance of venues with a capacity of up to 50 seats. Use in court rooms, conference rooms, classrooms, boardrooms, or basically anywhere temporary assistive listening system is needed.